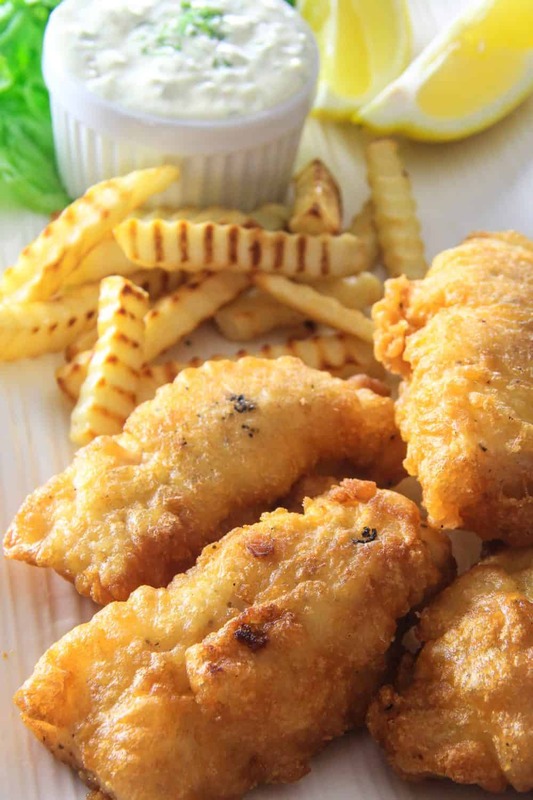 Beer Battered Cod is an amazing comfort food recipe perfect for gatherings with friends. Follow my easy recipe to make a batch of this flavorful fried fish recipe. Be sure to serve this with my Easy Tartar Sauce! Its practically a must have sauce when eating fish! This recipe was originally posted March 16, 2017, we’ve tweaked it a bit since then. This post may contain affiliate links. Read my disclosure policy here. As promised in my previous blog post, here’s a fish recipe! This one is a keeper! The bubbles in the beer give the batter body and lightness. That is what makes the fried fish so crispy. The key to good beer-battered cod is using quality fish. This recipe is so effortless and requires only a few ingredients! This is a great recipe to make large batches for a gathering with friends and family. A good fish fry is always sure to please a crowd! Prepare fish with salt and pepper before dredging in the beer batter you made according to recipe directions below. I find using tongs the best way to dredge the cod fillets. Fry in your choice of vegetable oil and allow to drain on paper towels or butcher paper before serving with your favorite fries, sides, and sauces. 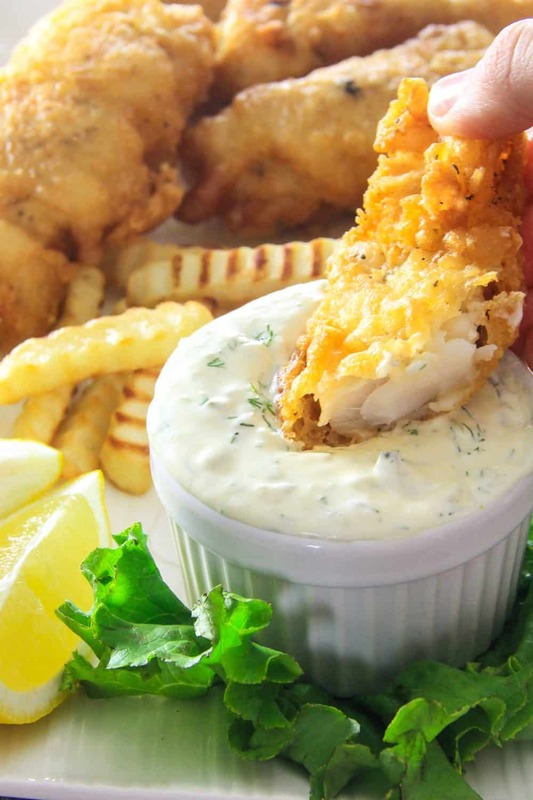 A good batch of beer battered cod with your favorite crunchy french fries or sides is a perfect weekend comfort food. If you like seafood and fish, make sure to check out all of my other recipes linked below. Pat the fish dry using a paper towel and season each cod fillet with salt and pepper. Open the beer and let it sit for about 15 minutes so that all the foam evaporates. Then combine the flour and beer with a whisk. Heat about 1 1/2 inches of vegetable oil in a heavy bottomed skillet over medium high heat. 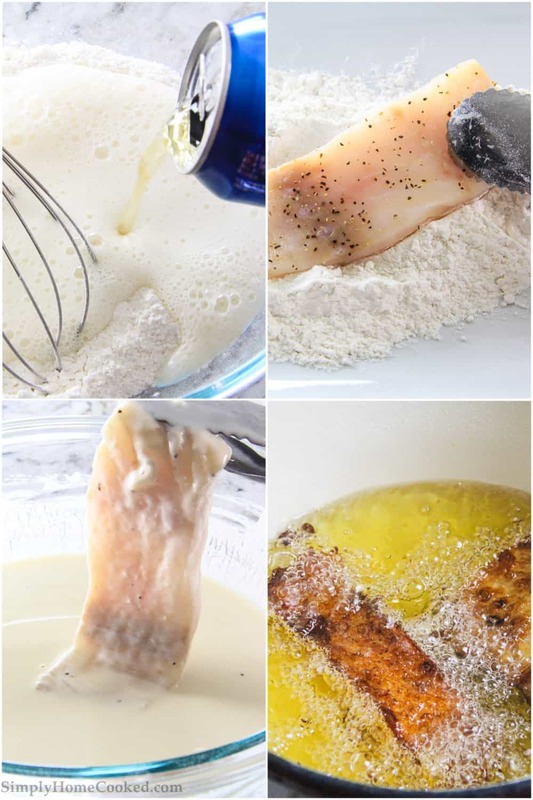 Dredge each cod fillets in the flour then into the beer mixture and fry in batches. Flip each fillet with tongs when they start to turn golden brown. Once the fillets are fully cooked, transfer to a dish lined with paper towels to absorb any excess oil.